This delicious smelling fall scrub will transport you to a cozy fall night roasting marshmallows and making s’mores around a campfire. Foamy and luxurious with just the right amount of scrub, this sugar scrub is a great addition to your fall product line. Add cut up clear soap to a microwave safe measuring cup. Heat in microwave in 30 second bursts until melted. Add glycerin to melted soap. Turn off mixer and add Foaming Bath Whip. Mix for 1 to 2 minutes until mixture looks like marshmallow cream. Turn mixer to medium speed and add one cup of sugar every 15 seconds until all sugar is added. In plastic beaker, mix fragrance oil and Vanilla Color Stabilizer. Stir and let sit for 2 minutes. 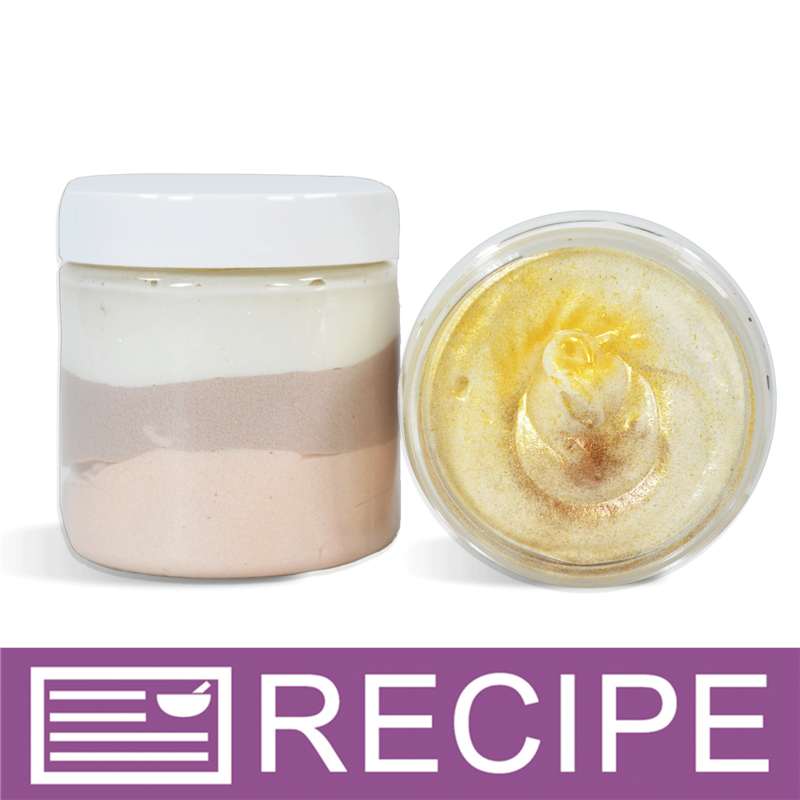 Add fragrance mixture to whipped soap and mix to incorporate. Divide whipped soap evenly among three bowls. Add a separate mica powder to each bowl - 1/8 tsp. Egyptian Bronze, 1/8 tsp. Matte Brown Oxide and 1/8 tsp. Iridescent Super Sparkle Glitter. Mix well to incorporate color. Fill the Powder Spray Set with Shimmering Dark Gold Mica Powder. Spray the top of the scrub in each jar with mica powder. Repeat steps 12 and 13 with Matte Brown Oxide Pigment. To Use: Massage scrub into wet skin. Rinse off with warm water. Ingredient Label: Sucrose, Glycerin, Water, Sodium Cocoyl Isethionate, Sorbitol, Propylene Glycol, Disodium Lauryl Sulfosuccinate, Stearic Acid, Sodium Laureth Sulfate, Myristic Acid, Sodium Hydroxide, Sodium Chloride, Fragrance, Diazolidinyl Urea (and) Iodopropynyl Butylcarbamate, Fluorphlogopite, Iron Oxide, Polyethylene Terephthalate, Acrylates Copolymer, Titanium Dioxide. "Can a different MP soap be used instead of Clear? I'm thinking maybe one that would provide additional moisturizing properties. Thanks!" Staff Answer You can substitute any MP soap base for the clear. "how many oz of product actually fits in the 8oz jar?" Staff Answer There is approximately 6.35 oz. per jar. "Is the Melt and Pour necessary for this receipe or can it be omitted?" Staff Answer We would not recommend omitting the soap because this gives the bath whip substance to keep the layers stiff enough so they don't blend together. "what in this product is not considered vegan?" Staff Answer We cannot state this product is vegan because it contains preservatives and we cannot be sure where the ingredients are derived from. "What ingredient(s) in this makes it not considered vegan?" "Would this be considered a vegan recipe?" Staff Answer This product would not be considered vegan.